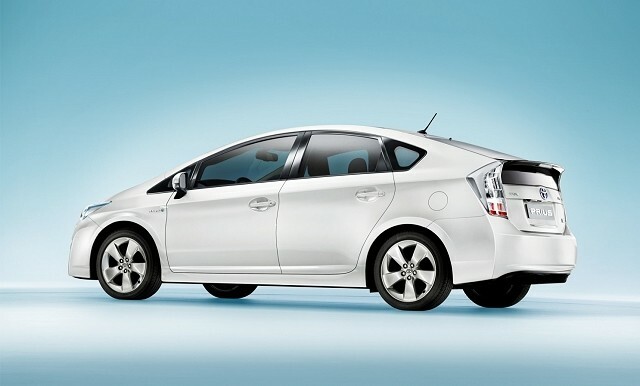 This is the Carzone.ie guide to the Toyota Prius. The third generation of Toyota Prius is probably the most conventional-looking version of the Japanese company’s long-serving hybrid yet. It came in a smooth, slippery, fastback five-door shape and promised diesel-like fuel economy from its mild hybrid petrol-electric drivetrain. It had a larger combustion engine than its two predecessors and was built on a new platform too, making it a more rounded proposition to live with and own than the older models. There is just one body shape, a five-door fastback, and one drivetrain choice for the Prius: a 1.8-litre VVT-i petrol engine, accompanied by an electric motor coupled to a 1.3kWh nickel-metal hydride (NiMH) battery. The Prius, as a mild series parallel hybrid, doesn’t run on electric power alone for long periods of time – instead, it uses the electric motor to supplement the petrol, occasionally coasting without the engine being on or being able to move at low urban speeds (below 50km/h) without recourse to the petrol unit. With a continuously variable automatic transmission (CVT), the front-wheel-drive Prius is therefore very easy to use and operate, making it particularly popular as a private hire vehicle; you’ll find plenty of used Priuses which are former taxis. Trim levels throughout the years varied, with most models coming with a good range of standard equipment. You want to seek out the Hybrid model in higher-specification trim, like Luxury, which will be a good bet as a fuss-free and low-cost family car, but watch out for mega-milers that have clearly seen service as taxis; the lower the mileage and the more equipment on a Prius, the better. The Toyota Prius Mk3 is not a particularly exciting car, but it is worthy, reliable, spectacularly easy to drive and also good on fuel – resulting in lower tax implications. It’s an ideal choice for urban commuters who can make the most of its clever drivetrain and, with a high level of mechanical simplicity – in the form of the CVT and lack of a turbocharger on the petrol engine, for example – there’s little to go wrong with a Prius. As long as you like its swoopy styling, you should get on fine with the hybrid Toyota.